JSON because of its lightweight is fast becoming the de-facto standard for data-interchange replacing fatty XML. Hence it is often used for serializing and transmitting structured data over a network. Almost all databases including traditional databases - Oracle, MySQL, SQL Server and document databases such as MongoDB allow you to export data in JSON format. Merging JSON data into templates for producing various business documents greatly enhance the organization’s efficiencies. Let’s take the case of sales operations. Sales teams fill templates manually with CRM data to create proposals and after-sales documents. Exporting CRM data as JSON and auto-populating templates with it save sales team from tedious, expensive and error-prone manual document creation tasks. Such automation benefits every department of the organization including Legal, Finance, Marketing. Moreover, business users can users can auto-generate documents on-demand without seeking IT support. If you are looking for a DIY system to generate documents from JSON data then possibly EDocGen is the only solution. With an intuitive interface, you can map dynamic fields of the template to JSON data thus controlling the data you wish to show on your document. It supports the dynamic population of text, tables, content blocks, hyperlinks and images from JSON data. It also supports multi-lingual templates, conditional statements (if-else), calculations. EDocGen is the perfect solution to auto-fill JSON file to Word template. Ease of Template creation: Business users can use existing document templates to auto-generate documents. It doesn't force users to switch to the system's templates/formats. Business users can convert existing document into template just by adding few tags into their word document template. Then populate these templates with JSON data to generate documents. Use JSON data as-is: You can populate the JSON data as-is without any data transformation. In the mapper screen (field map), map JSON data to dynamic fields. On this screen, all dynamic fields in your document template get listed along with drop downs of JSON keys. All you need to do is select the appropriate JSON key for each dynamic template field. EDocGen supports both on-demand and bulk document generation. Following sections describe how to convert JSON to Word using EDocGen. There are two ways to populate JSON file to MSWord template - Through App UI and API. The first step is to convert the existing template into EDocGen ready template. Add the relevant dynamic tags for the fields you would like to replace with JSON data. EDocGen uses these tags to identify the dynamic sections of the template. EDocGen supports the dynamic population of text, tables, images, text areas, hyperlinks and content blocks. After adding tags, upload template into EDocGen. Hover over document template to see “Create Document” action button. Click on it and in the drop-down select “generate documents from JSON". Upload JSON and map JSON elements to template's dynamic fields. Click generate button to create documents. As you can see, no JSON data transformation is required for JSON to Word document creation. You can use any JSON file format and populate that into the template, using the mapping screen. If you use the same JSON format multiple times, mapping it every time is time-consuming particularly if your template has a large number of dynamic fields. By naming the template's dynamic fields in line with the JSON keys, you can skip the mapping screen and auto-fill data. Please refer to working example for a detailed account of how to go about excel to word document population. It's Windows OpenXML based API that supports filling of dynamic text, tables, content blocks, hyperlinks and images in word templates with JSON array data. The process is very similar to above. In Step1, add relevant dynamic tags to your template. In step2, upload the template into EDocGen through API. In step3, call API function by passing the template ID and JSON file. EDocGen is API first product and supports nested tables up to 4-level JSON files. 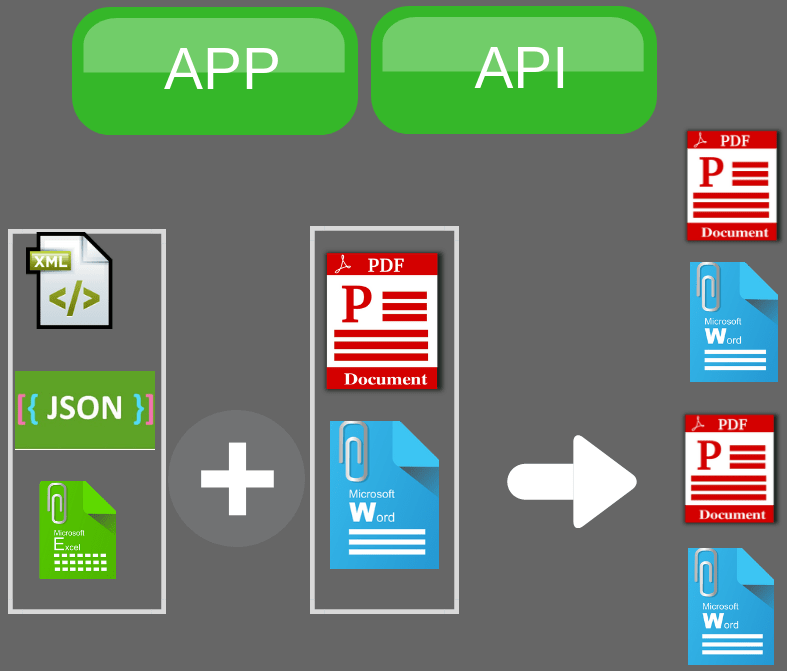 EDocGen is the simplest and fastest solution to convert JSON file to Word, online or through API. Moreover, it supports multi-lingual templates, conditional statements (if-else), and calculations. For example, you can populate JSON data in French, Japanese, Spanish etc. to generate multi-lingual documents. Register and start populating your JSON data into Word template. Give it a try by registering. Trial is better than reading 1000 words.